Make the most of your firepit and create a comforting pudding ideal for cosy evenings outdoors. One of the most exciting things about a glamping holiday is the opportunity to cook outside! As well as a stove, all of Lantern & Larks glamping tents come with a firepit, which is perfect for both warming yourselves and for creating delicious meals under the open sky. This recipe is an especially great one for glampers because you're likely to find the two essential ingredients on site. 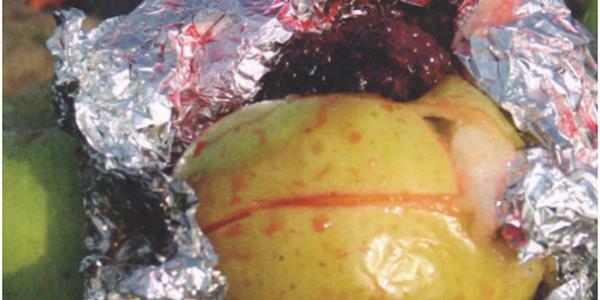 Simply stuff a cooking apple full of blackberries and cook in foil until golden. It'll come out bursting with colour and flavour. This simple yet effective dessert is both delicious and healthy, and allows you to really embrace your autumnal surroundings. Indulge yourself during you Glamping break with the flavours of this rich, comfortable season... not to mention it smells amazing! Thanks to the Cool Camping Cookbook, 2nd edn. (Punk Publishing) for the recipe and photos. 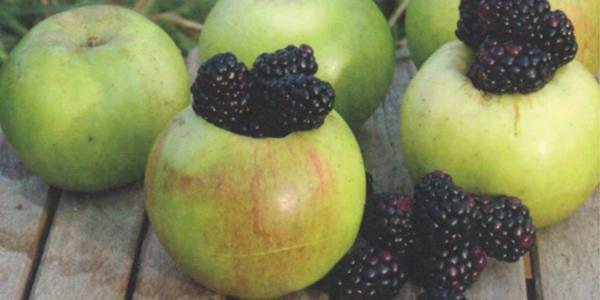 An autumnal favourite, especially if the apples have been recently hoiked from their tree and the blackberries are freshly picked. If you’ve got some cinnamon to hand, that’d just be extra-cosy. Score a line around the waist of the apple to prevent it from splitting and exploding. Partially core it, leaving about 1cm of apple at its base. Sprinkle over a little cinnamon, if you have any, then fill the hole by squishing in as many blackberries as possible. Wrap the lot in foil and rest in the embers of the campfire. Cook for 20 minutes, turning the foil-wrapped apples regularly. When ready, the apple should be a golden-brown, giving up fluffy, crimson-stained flesh. Carefully unwrap and serve with lots of cream, if you like, and any leftover blackberries. Note: You can also use blueberries or other berries to fill your apples. Be as creative as you like! You could also top with oats etc for a crispy topping… For a fun evening around the firepit, why not have everyone create their own version of this delicious desert, and judge whose is the best?